Seven of Tesco's hypermarket stores will be operating round the clock as the Hari Raya celebration nears. 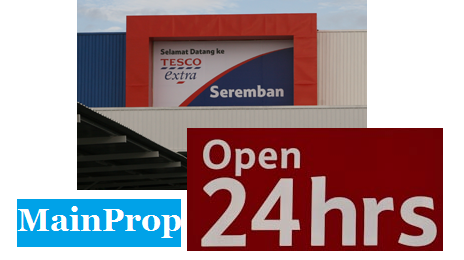 Tesco is the first hypermarket to extend a 24-hour service and introduce special prices for several of its products. It was also the first time for the hypermarket to embark on such an initiative ahead of any festive season. Tesco Malaysia CEO Datuk Georg Fischer said, the extended hours were for the convenience of its customers who are rushing to complete their Hari Raya shopping amidst their busy schedule. "We have extended our hours of service for their convenience and to ensure that our customers are able to fully benefit from the great 'Lebih Jimat' deals we have introduced. "To further add to the excitement, we will further drop prices on several of our products so customers are guaranteed unbeatable deals," Fischer said during the special announcement of the 24-hour service at Tesco Extra Shah Alam today. The extended hours will only be held for three days beginning Friday, July 10 to Sunday, July 12, 2015. Apart from Tesco Extra Shah Alam, other participating Tesco stores are Tesco Extra Ampang, Tesco Kajang, Tesco Seri Alam, Tesco Seberang Jaya, Tesco Extra Seremban 2 and Tesco Extra Mergong. In a bid to show its appreciation to its customers, Tesco will also be giving out complimentary 'sahur' packs to shoppers after midnight.